How to Clean Your Room should be an obvious one to you - especially if you are the mother of a toddler who is in the process of learning how to do exactly that. The message of this book is that we should take care of our rooms because they are special places where we can imagine and dream. It's a nice motivating thought, of course, helped along by pop-ups and hidden flaps. Naturally, Bookworm1 needed some additional and direct motivation to actually dare to dream about cleaning his room. That said, there are so many fun aspects of this book (i.e., that "peek, pop, turn, and pull" stuff I mentioned) that Bookworm1 finished looking through it and promptly stated, "This is a GREAT book, Mommy!" Since we are currently learning the fine art of book reviewing (even at the tender age of three) I cuddled up with him and gave this book adequate attention at his recommendation. 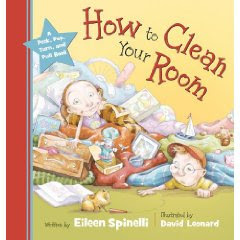 Again, this book isn't going to make a child clean his or her room but it will give them something else to put in it. You know how I periodically say that "If I ever have a girl I would...."? Well, if I ever had a girl I would be sorely tempted to name her Natalia for the sole purpose of enjoying this book with her. That should clue you into the fact that Mommy enjoyed Natalia's Favorite Color more than Bookworm1 did, although he politely sat and read it with me. THIS BOOK IS AWESOME! It's all about a little girl named Natalia who starts taking an art class and is instructed by the teacher to select a favorite color and announce her preference to the class. 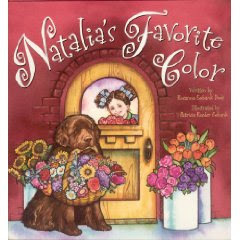 The problem is that Natalia can't decide which color is her favorite and so she turns to her grandmother, a florist, for help. Her grandmother introduces her to a whole rainbow of colors by teaching her about different flowers. In the end, Natalia decides that she cannot pick a favorite. She just likes them all! Prior to this book Bookworm1 consistently stated that he had one particular favorite color. However, after reading this book he has been telling me (almost on a daily basis) that he "just likes all the colors." I have a feeling this book influenced his thoughts on this subject matter, not that I mind. It will be interesting to see what color he finally lands on as being his favorite - if he ever does. In the meantime, I honestly and truly enjoyed this book and am happy to recommend it! 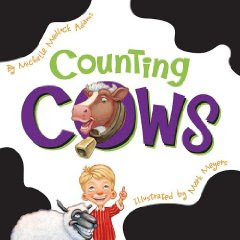 Lastly, we have Counting Cows which Bookworm2 staked a claim on from the get-go. The idea behind this book is that it can be tiresome to try to fall asleep by counting sheep. Why not be original and count cows instead and in a boogie woogie kind of way? This book is infinitely more amusing if you can get mommy to silly dance while reading it. However, the chances of that actually occurring are questionable - and certainly never when daddy is at home to mock. All the same, this book is very catchy to a one year old who is still working on the concept of what a book actually is. He is fond of song and dance though and so we're just bringing Counting Cows into the mix and doing a little Moo Cow Jive on the sidelines. What won't a reading mother do to draw her kids into the book world? There's very little I'll stop short at, lemme tell ya! Even at the jive. Thanks, Ideals Books, for the fun! How to Clean Your Room sounds like a book all mamas need to use. :) In fact, I should be supervising clean up right this minute as I am sure the noises I'm hearing have nothing to do with cleaning their rooms. Those look like great books! Thanks for the reviews. How to Clean Your Room is going on The List! I love Eileen Spinelli and look forward to seeing this new book! Counting Cows looks cute too!!! Thanks!